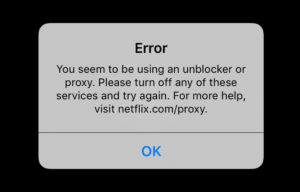 Netflix has recently announced that they have started blocking various unblocking services aimed at giving users access to the full Netflix catalogue regardless of the users location. These services have long been a thorn in the side of the content holders rather than Netflix, who are getting paid anyway. In a recent blog post Netflix has announced that they will start blocking various proxy services and apparently this has already started happening. Some users have been meet with the message “You seem to be using an unblocker or proxy. Please turn off any of these services and try again“. However, the various providers in the market has all announced that they will be adapting to the changes put forward in order to continue to support region switching for Netflix. Our test winner Unlocator is still 100% compatible with Netflix and by the looks of it they will continue to be. The Unlocator DNS service allows you to unblock 218 different channels and switch between 31 different Netflix regions. All you have to do is change a single number in your network settings on the device you want to use. You can use the service on anything from a computer to a smart TV. The list is endless. Even if you have never tried changing network settings on your device before you will be set up in minutes – really. Unlike other services, Unlocator only routes a small amount of your traffic, which in turns mean that you don’t see any type of speed reduction. On top of that the service allows you to appear in more than one place at a time. You can watch BBC iPlayer and US Netflix at the same time! Wow that is awesome – my VPN stopped working with Netflix yesterday. So glad I found this so I could get back on track.